The reliefs and murals of temples in mainland Southeast Asia, such as the famous Angkor Wat complex in Cambodia, the temples of the city of Pagan in Myanmar, and the royal temple, Wat Phra Keo, in Bangkok, include thousands of figures related to dance in their iconographical programmes. Many of them give valuable information about dance from periods of which very little, if any, textual evidence exists to throw light on this subject. This study seeks to analyse these dance images by applying and expanding the dance iconographical method formulated in the 1990s. The undeniable Indian influence on the traditions of dance and image-making in Southeast Asia will be discussed, while the focus will be on the localisation process of the Indian influenced prototypes in Southeast Asia. 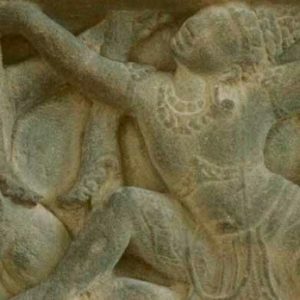 This study argues that the dance images in the temples of mainland Southeast Asia reveal more information about dance if they are examined as an integral part of the iconographical programmes of sacred buildings than they would do if observed only as separate images isolated from their architectural context in which they were originally created. The reason for this is the fact that both Hindu and Buddhist temples were built to reflect the structure of originally Indian cosmology. Thus the building became an image of the cosmos with its inhabitants and with even ethical connotations. When observed in this context, the dance imagery of these temples reveals several things about dance, its history, its forms and its role in the cultures of mainland Southeast Asia.